I have been dying to share this easy DIY project that combines two of my favorite pastimes: thrifting and crafting! 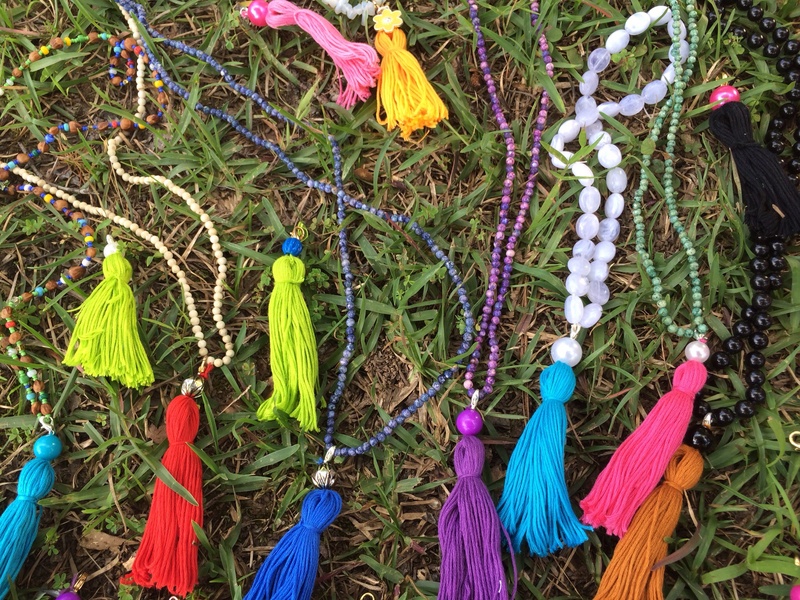 Tassel necklaces are very trendy right now and these are the perfect way to add a little splash of color to your outfit as we head into fall. All you will need are vintage beaded necklaces, embroidery thread, and lobster clasps. You can buy inexpensive bead necklaces at Michael’s craft store, but we picked a few up from Palmetto Thrift and also used a few vintage necklaces that belonged to my grandmother. The best part about this project is that the tassels will be interchangeable, so you can change them anytime to get a different look. Both retro and handcrafted, these necklaces end up different from any you will find in a store. To create the tassels, you will use the entire bundle of embroidery thread. Take it out of its wrapper and tie an extra piece of thread firmly around the middle of the bundle, being sure to leave some extra length. (This will be the top of the tassel). Thread a bead on to those threads and tie them firmly to a lobster clasp. (Now you can hang it anywhere). Next, holding your tassel-in-progress by the top, fold down the bundle so that all threads are hanging together neatly. Tie another piece of embroidery thread about an inch down from the top to create the tassel. It looks best if you wrap it a few times and tie firmly. You can try to hide the ends of your knot in with the rest of the hanging ones, but good luck with that. Remember, boho style is perfect in its imperfection. At least that’s what I told myself. Finally, trim all the threads hanging down so that they are all loose and tassel-ish! Hang from your necklace and you are all done! Isn’t that adorable? 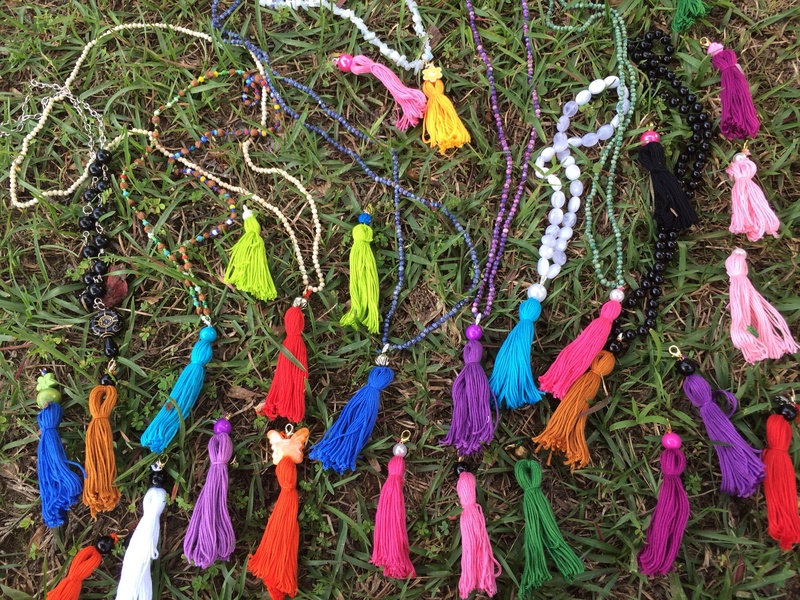 As you can see, we went a little tassel crazy at my house. But once my twins got started making them, they just couldn’t stop. I hope you enjoy this project as much as we did. Happy Tasselling! This entry was posted in Fashion, Leah Prescott and tagged Columbia, DIY, every woman blog, Famously Hot, Leah Prescott, lexington medical center., Midlands, South Carolina, Tassel necklace by lexingtonmedicalcenter. Bookmark the permalink. These are so cute! Thanks for the easy instructions- I’ve seen these on some celebs and wanted to try making it instead of paying a fortune :)! Hi Smitha, thanks for your comment. I hope you had a chance to try this necklace, I wear mine all the time! Thanks for your comment Smitha! I hope you had a chance to make one of these, I wear mine all the time!